Britain's richest raceday takes place at Ascot on Saturday with one horse on course for a prize money milestone and another seeking a Royal triumph. 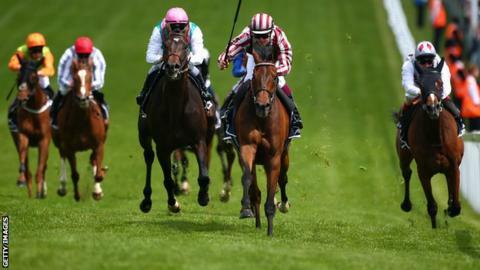 French-trained Cirrus Des Aigles runs in the Champion Stakes where he is set to take his career earnings past £6m. Rivals include Noble Mission, younger brother of Frankel, who beat Cirrus Des Aigles at this meeting two years ago. Meanwhile, the 2013 Gold Cup winner Estimate - owned by the Queen - contests the Long Distance Cup. The going at Ascot on Saturday morning remained heavy, soft in places ahead of the £4m card on Saturday afternoon. Chris Stickels, clerk of the course, said: "Our normal average rainfall during October is 80mm and we have had 90mm so far this month. "We had a millimetre and a half overnight. We were quite lucky as we had been forecast more. But there are likely to be showers through the day so we could still get wet." Cirrus Des Aigles, an eight-year-old trained by Corine Barande-Barbe, won the Champion Stakes in 2011 before finishing runner-up to Frankel and Farrh in the subsequent runnings. A victory for the gelding, who has racked up £5.86m in earnings so far, would be a popular one as the Coronation Cup winner has built up a big following and will be seeking a 22nd win in his 60th start. "He is the favourite and we have big hopes he can win, of course, but the race is never won until after it is run," said Barande-Barbe. "I know Frankel's brother, Noble Mission, is running. We could not beat Frankel, so hopefully we can beat his brother." Noble Mission is trained by Lady Cecil - the widow of 10-time champion trainer Sir Henry, who guided Frankel through an unbeaten 14-race career which climaxed with his victory on Champions Day in 2012. Other contenders in the mile-and-a-quarter contest, worth a total of £1.3m, include two talented Irish raiders. The lightly-raced Free Eagle represents Dermot Weld, while Joseph O'Brien, riding for his trainer father Aidan, replaces Frankie Dettori on the 2013 Derby winner Ruler Of The World. In the opening race, Estimate faces O'Brien's Leading Light, who just denied her a second Gold Cup at Ascot in June, after which the Queen's filly tested positive for morphine from a contaminated feed. Estimate won the Doncaster Cup last time out and trainer Sir Michael Stoute is hopeful she will run well again. "I'm very happy with Estimate. She loves Ascot, but she will have to take on Aidan's Gold Cup winner, Leading Light - and he is a very good stayer, no doubt about that. He'll be hard to beat, but we think we're in very good shape,'' said Stoute. In the Queen Elizabeth II Stakes, champion jockey Richard Hughes will ride the surprise 2000 Guineas winner Night Of Thunder, with Kieren Fallon on stablemate Toormore. G Force is favourite for the Champion Sprint Stakes, while Silk Sari and Seal Of Approval are among leading contenders in the Fillies and Mare Stakes.